I spent much of this week under m welding helmet. I was building the giant armature for the tree that will be 'planted' on the roof of the Under Hill suite of the Hazelnut Inn. It will function as a skylight to the suite below. The first stage was the waterproof flashing/roof that was fabricated to fit over the pony walls of the cast concrete opening. Then I welded the heavy structural steel which will keep everything upright and stable while we apply the concrete skin. Lifting points will be built in to lift it into place. We first have to calculate the center of gravity for the piece to ensure it lifts and hangs straight from the crane without stressing the concrete work. 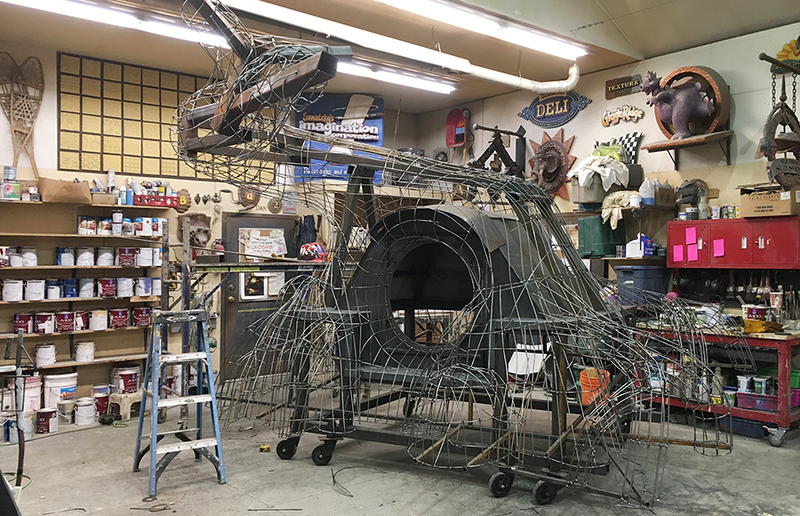 To build the armature we used many hundreds of feet of one quarter inch thick pencil rod. It comes in twenty foot lengths. This was hand formed and welded into a sturdy grid. Lots of rods are welded back to the structural steel frame to make it wiggle proof. The crew will next tie on the galvanized lath to this framework. That mech will in turn support and reinforce the fibreglass reinforced concrete skin which we will trowel on and then sculpt.